Here’s a story that not many of us learned in school, not even those of us who grew up in Texas: the attempt to create a second Germany in the Republic of Texas. But what if the surplus population could be sent somewhere else? That’s what the nobles were gathering to discuss. One of them, a count named Carl of Castell-Castell, thought it might be possible to send people to the Republic of Texas, a former Mexican colony that had won its independence six years earlier. The republic was actively seeking Europeans who would settle in Texas, and had set up a system of land grants to attract them. Speculators were encouraged to buy huge tracts of land at rock-bottom prices, then recruit settlers to live on the land. Once the settlers were living on the grant, the speculators would be awarded additional tracts of land in payment. These tracts could be sold for a profit, and the money used to bring more settlers to Texas. If a “new Germany” could be established in Texas, Castell argued, the nobles would benefit as much as the people who settled there. The colony would be a market for German goods and a source of raw materials for German manufacturers. It would also help Germany develop trade with Mexico. Whatever money the nobles invested in the German colony, Castell told them, would be repaid many times over in the years to come. And there was another benefit that Germany’s royal families might have valued more than any other: the possibility of creating vast new estates for themselves. During the wars with Napoleon Bonaparte from 1805 to 1810, many of Germany’s ruling families had been stripped of power when their kingdoms and principalities were incorporated into the Napoleonic empire. After Napoleon was defeated in 1815 and the Congress of Vienna redrew the map of Europe, not all of the old kingdoms were restored. Just as Texas had won independence from Mexico, a new Germany might one day win independence from Texas. The dispossessed nobles might then be able to carve out giant new territories that they and their descendants could lord over for centuries to come. 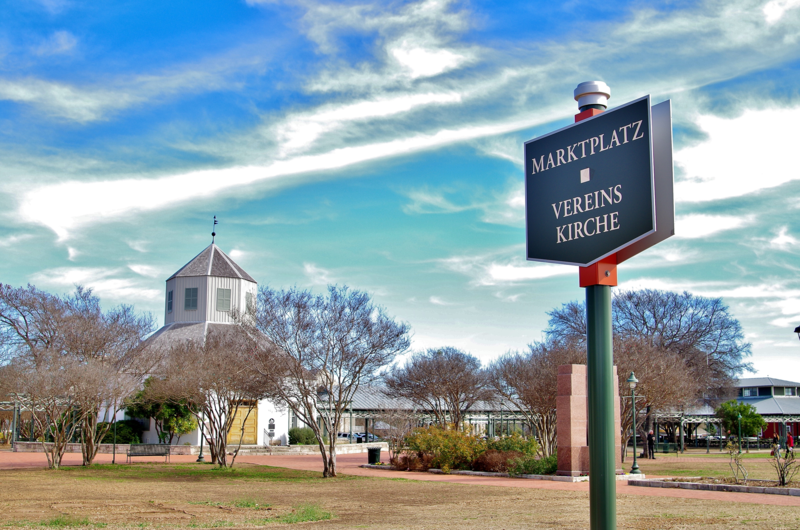 The nobles who met at Biebrich am Rhein agreed to form a group called the Adelsverein, or “Society of Noblemen,” to explore the possibility of creating a new Germany in Texas. In May 1842, the Society dispatched two of its members to Texas: Count Victor zu Leiningen, older half-brother of England’s Queen Victoria, and Count Ludwig Joseph de Boos-Waldeck. They arrived in the port city of Galveston the following August. After meeting with President Sam Houston and apprising him of their plans, they toured the republic and visited the scattering of Germans who had settled in various Texas communities over the previous decade. Leiningen and Boos-Waldeck purchased the Society’s first piece of Texas real estate—4,428 acres of land in modern-day Fayette County, which they acquired for 75¢ an acre—and named it Nassau Farm in honor of Duke Adolph of Nassau, the honorary “patron” of the Adelsverein. Nassau Farm was intended as a headquarters for members of the Adelsverein when they visited Texas and also as a possible stopping point for German settlers on their way to their own land…which the Society had yet to buy. Leiningen returned to Germany in May 1843. He arrived home full of enthusiasm about the possibilities that Texas had to offer—limitless, virtually free land and winters so mild that crops could be grown year-round. But he also warned that settling large numbers of Germans in Texas was going to cost a fortune, far more than the Adelsverein had planned to spend. The Society embraced his positive description of the republic…and ignored his warnings about the costs. Perhaps because of this, Leiningen returned to his military career in Austria and played no further role in the Society. When Boos-Waldeck returned home a year later and vigorously opposed large-scale colonization because of the high cost, the Society ignored him, too. Insulted, he dropped out of the Adelsverein. In June 1843, the Adelsverein reorganized itself into a stock company, and the nobles ponied up $80,000 (about $2 million today) in capital to get it started—a sum far less than both Leiningen and Boos-Waldeck had said would be needed. As if starting the project with too little money wasn’t bad enough, the Adelsverein made matters worse by being taken in by not one but two different land swindlers who sold them worthless rights to two land grants: the Bourgeois-Ducos grant and the Fisher-Miller grant. Both grants had expiration dates that required settlers to be on the land by a certain date, otherwise the grant became null and void. The Bourgeois-Ducos grant had already expired, and the Fisher-Miller grant was about to, when the Adelsverein spent thousands of dollars of its limited (and inadequate) funds to buy them. The Adelsverein compounded the problem by hiring the same swindlers, Alexander Bourgeois and Henry Francis Fisher, to purchase supplies for the settlers and arrange for their transportation to their new homes when they arrived in Texas. Bourgeois lasted only four months before his services were dispensed with; Fisher lasted much longer and did a lot more damage. Other than Nassau Farm, which was too small to serve as a homestead for the thousands of settlers it hoped to sign up, the Adelsverein still didn’t own any land that it could send people to. But it thought it did, and that was enough for it to begin recruiting settlers. In the spring of 1844, the Society began placing advertisements in German newspapers with the slogan Geh Mit Ins Texas (“Go with Us to Texas”) and printed brochures describing the sweetheart deal the Adelsverein was promising to provide. The Adelsverein never bothered to explain how it was going to pay for all of this, but it didn’t matter because few people bothered to ask. The Society also promised not to settle more than 150 families the first year, and no more than it was able to accommodate after that. This was the first promise it broke. Within a month of running its first newspaper ads, the Adelsverein signed up more than 10,000 Germans to go to Texas, and no sooner were they signed up than the Society began chartering ships to take them there. Even if the Society hadn’t yet realized that its land grants were worthless and it had no place to send the settlers to, it certainly understood that the supplies and infrastructure it promised had yet to be purchased or built. But it soon began sending the settlers to Texas anyway. The first ship set sail in the fall of 1844 and arrived in Galveston in late November. By then the Adelsverein’s official representative, Prince Carl of Solms-Braunfels, had been in Texas for nearly five months. His job, and that of the land swindler Henry Francis Fisher, was to prepare for the settlers’ arrival by purchasing everything they would need. Fisher embezzled the money he was supposed to use for that purpose; Prince Carl, though honest, was incompetent and no better than Fisher at accomplishing the task. Prince Carl did pay a visit to the Texas capital at Washington-on-the-Brazos, where he received more bad news about the Fisher-Miller land grant. Not only was the grant worthless, the Texans informed him, but the land was shockingly unsuitable for settlement. For one thing, the grant was 300 miles inland from Galveston, which made it all but impossible for settlers to get to. It was also 90 miles from the nearest Texas town, and deep inside Comanche and Apache territory. These hostile tribes weren’t about to let European settlers on their land without a fight. Even if peace could be made with the Indians, the land was rocky and largely unsuitable for farming. It was so unsuitable, in fact, that the government of Texas was willing to overlook the fact that the Fisher-Miller grant had expired and let the Society have the land anyway, if it was dumb enough to actually want it. Prince Carl forwarded this information to the Adelsverein in Germany, along with his recommendation that the Society look for a better piece of land, one outside of Indian territory, more suitable for farming, and closer to the port of Galveston. The Adelsverein replied by instructing him to continue preparing the Fisher-Miller grant for settlement. Rather than purchase supplies and begin hiring the wagons that would be needed for the 300-mile trip to the Fisher-Miller land, Prince Carl tackled what he considered a far more pressing problem. The effete, high-born prince had clashed with the uncouth and unwashed Texans, Americans, and Mexicans from the moment he’d arrived in Galveston. He was concerned that the settlers would lose their essential “Germanness” if allowed to mingle with such rabble. So rather than look after their more basic needs, like food, transportation, and shelter, he wasted precious time and money looking for a more “suitable,” more isolated place for the settlers to land. He found one on a barren island called Indian Point, about 100 miles south of Galveston. Prince Carl apparently intended to ask the Adelsverein to hold off on sending any settlers to Texas until suitable accommodations could be built there. But it was too late—six days before he finalized arrangements with the owner of Indian Point to land the Society’s settlers there, the first Adelsverein ship arrived in Galveston on November 23, 1844. And more were on the way: As many as 200 families—more than 700 settlers in all—would arrive by the end of December. These settlers had gotten their first taste of the Adelsverein’s inability to live up to its promises on the way across the Atlantic. Instead of hiring modern steamships, which could make the crossing in as few as 18 days, the Society chartered sailing ships, which took two months. Only the cheapest ships had been hired, ones crawling with rats, fleas, and lice, which soon infected the passengers with typhus that in many cases proved to be fatal. The food aboard the ships was inedible; the “drinking” water was indescribably bad. There were no doctors and no surgeons provided; any people who fell ill during the passage had to fend for themselves. And yet as bad as conditions were during the voyage, when the settlers arrived in Galveston and saw that preparations in Texas were no better than they had been on the boats, many felt safer returning to Germany aboard those very same boats rather than place any more faith in the Adelsverein. The settlers who went back to Germany, it turns out, were the lucky ones. Not long after the first shipload of German settlers arrived in the port of Galveston, Prince Carl arranged for them to be transported to Indian Point, where they were housed in tents and sheds that had been thrown together to accommodate them. The settlers squatted there for more than two months before the prince finally hired enough wagons to begin moving them in the general direction of the Fisher-Miller land grant. By that time, the prince had decided that making the 300-mile journey all at once was too much for the settlers, since 1) the land grant was deep inside hostile Comanche country, and 2) neither he nor anyone else associated with the Adelsverein—not even Henry Fisher, one of the men for whom the Fisher-Miller land grant was named—had ever set foot on it. So as the wagon train slowly made its way northwest along the banks of the Guadalupe River in January 1845, Prince Carl raced ahead, searching for a suitable site for a way station that would allow these and future settlers to travel to the land grant in stages. He found one about 165 miles inland from Indian Point, near a natural spring called Las Fontanas, on the road connecting Austin (45 miles to the northeast) to San Antonio (30 miles to the southwest). There, in mid-March, he bought two leagues, or about 18 square miles of land, for $1,100. Seven days later, the wagon train arrived at the spot. Each household was awarded a lot in what would soon become the town of New Braunfels (named in honor of Braunfels, the prince’s family estate in Germany), and a ten-acre parcel outside of town that they could begin farming right away. It was a far cry from the 320 acres they’d been promised, but after everything the settlers had been through, they were eager to start their new lives. As for Prince Carl, he remained in New Braunfels for about a month before he abruptly announced that he’d resigned his post and was going back to Germany. He never returned to Texas. He didn’t even stick around New Braunfels long enough to see his successor, Baron Ottfried von Meusebach (who soon Americanized his name to John O. Meusebach), arrive. Why did the prince leave so quickly? Meusebach got his first clue soon after he arrived at New Braunfels in May 1845 and had a look at Prince Carl’s financial records. He discovered that not only had the prince spent every penny he’d been given, he’d also racked up more than $34,000 of unpaid debts. By now the Adelsverein had already spent most of its $80,000 grubstake resettling thousands of Germans in the Fisher-Miller land grant, and all it had to show for its money was a few hundred settlers living in New Braunfels, well outside of the grant, plus some stragglers who remained at Indian Point. Even worse—at least as far as the Society was concerned—two months earlier, on March 1, 1845, President John Tyler had signed a joint resolution annexing the Republic of Texas to the United States. With Texas joining the Union, whatever chance there had been for a “new Germany” on Texas soil, complete with its own German monarchy and nobles lording over giant estates carved out of the territory, was gone forever. The purpose for creating the Adelsverein having been defeated, the nobles were quickly losing interest in putting any more of their money into the lost cause. That would have been bad enough if the only people depending on the Adelsverein’s largesse were the settlers at New Braunfels and Indian Point, but thousands more settlers were already on their way. Precisely how many has been lost to history: The passage of time and the destruction of records in hurricanes in 1875, 1886, and 1900 make an accurate count impossible. It’s estimated, however, that from October 1845 to April 1846, between 36 and 50 ships arrived in Galveston carrying no fewer than 5,200 settlers and possibly more than 8,000. It’s a mystery why the Adelsverein didn’t just cancel the ships that hadn’t already departed for Texas—perhaps it didn’t want to refund the money the settlers had already paid in. Whatever the reason, the ships full of settlers kept coming, and Meusebach had to find a way to prepare for them. He didn’t get much help from the Adelsverein. Though Meusebach estimated that he needed at least $120,000 to feed and house the new settlers, plus pay the debts Prince Carl had racked up, the Society gave him just $24,000. That wasn’t even enough money to provide adequate shelter at Indian Point, and as a result, many hundreds of settlers shivered through the unusually cold, wet winter in whatever lean-tos, dugouts, or other shelter they could improvise for themselves. Many made do without any shelter at all, huddling in blankets out in the damp, open air. Healthy people would have had a hard enough time surviving under such conditions, and these settlers were anything but. They’d come across the Atlantic on the same kind of rat-infested ships the first group of settlers had. They were weakened by scurvy from the poor shipboard diet and by typhus carried by rats. Disease would kill some 300 on board the ships before they even made it to Texas. Once the remaining thousands were huddled together at Indian Point without adequate food or shelter or sanitation, cholera and dysentery from polluted drinking water (plus malaria, yellow fever, typhoid fever and other diseases carried by mosquitos that bred in nearby swamps) would soon kill hundreds more. Meusebach did his best to keep the settlers alive as more and more of them arrived at Indian Point. By March, he’d hired enough wagons to begin transporting them in groups to New Braunfels and also to a second settlement called Fredericksburg that he’d established as a second way station 60 miles beyond New Braunfels. When he wasn’t arranging transportation, he scrambled around the countryside buying up grain and livestock (on credit whenever possible) to feed the settlers. In April, he went to Nassau Farm, the Adelsverein’s plantation east of New Braunfels, to see if they’d grown any crops that could feed the settlers. The managers told him they’d planted cotton, a cash crop, instead of food crops and had no food to spare. Falling ill with fever, Meusebach spent three months recovering at Nassau Farm, far from the settlers who needed him. If the settlers who’d survived the hard winter months at Indian Point thought the worst was finally over once the wagon trains started moving, their relief lasted only until May, when war broke out between the United States and Mexico, and the U.S. government appropriated all their hired wagons for the war effort. Thousands of men, women, and children were still stranded at Indian Point. Of these, some 500 gave up the fight and went back to Germany. Another 500 men who were of military age enlisted in the U.S. Army to fight in the war, perhaps calculating that they had a better chance of survival on the battlefield than they did in the hands of the Adelsverein. Such an assessment would not have been wide of the mark: By now the conditions at Indian Point were so desperate that many settlers decided to walk the 165 miles to New Braunfels rather than remain any longer where they were, waiting for Meusebach to return. During these difficult months Meusebach had sent one report after another to the Adelsverein in Germany describing the situation and begging for money to keep the settlers from starving. His pleas were ignored. When he was finally well enough to travel to Galveston, he instructed the Adelsverein’s agent there to send another report to Germany…only this time to German newspapers, not to the Adelsverein, in the hope that the newspapers would make the German public aware of the settlers’ plight. That did the trick. In the summer of 1846, when the newspapers began describing in vivid detail how the Adelsverein had left the stranded settlers to starve in Texas, the Society coughed up another $60,000 and sent it to Meusebach. The money didn’t arrive in New Braunfels until September, by which time hundreds more settlers had died from hunger, exposure, and disease. Adding $60,000 to the $24,000 Meusebach had started with still came up well short of the $120,000 he felt was necessary to provide for the settlers, but it was enough, at least, to keep them from starving. And with contemporary estimates placing the death toll as high as 1,600 people, the sad truth was that Meusebach now had many fewer mouths to feed. The bad publicity created by the newspapers and by disillusioned settlers returning to Germany also helped ease the crisis by bringing new arrivals to Indian Point to an end. Those settlers who had not yet left Germany canceled their plans, and those who stopped in Galveston on their way to Indian Point refused to go any farther. They settled in Galveston and other settlements, and established their own communities rather than take any more chances with the Adelsverein. With the worst of the crisis over, Meusebach managed to do something that no one associated with the Adelsverein had yet been able to do: In January 1847, he stepped onto the Fisher-Miller land grant. He did so as the head of a 45-person expedition into Comanche territory, where he made peace with the Comanche chiefs and signed a treaty that opened more than three million acres of land to settlement. The treaty was one of Meusebach’s last acts as an official of the Adelsverein. By the time he signed it, he’d already sent his letter of resignation off to Germany; it went into effect when his successor, a man named Hermann Speiss, arrived in July 1847. Speiss’s job would be much easier than Meusebach’s had been. Much shorter, too, because not long after he arrived, the Adelsverein sent word that it was bankrupt and that the settlers were on their own. The Adelsverein was dead and so was the idea of a Germany in Texas. But the Germans themselves kept coming, in ever-growing numbers and on their own instead of under the sponsorship of incompetent, self-interested aristocrats. By 1850, there were more than 33,000 Germans living in Texas, comprising more than one-fifth of the white population and making them one of the largest ethnic groups (after Latinos). The German immigrants tended to form their own German-speaking communities rather than assimilate with their English-and Spanish-speaking neighbors. Texas was a slave state: It seceded from the Union during the Civil War, and because the Germans opposed slavery, they suffered at the hands of other Texans during the war. (Fredericksburg was placed under martial law.) The abuse intensified the determination of German Texans to keep to themselves and to refuse to learn English. Few of their schools taught English or had English-speaking teachers until the early 20th century. These communities might still be speaking their own unique dialect of “Texas-German” today were it not for the fact that Germany and the United States were on opposite sides in both World War I (1914–18) and World War II (1941–45). During the war years, the stigma of being German was so strong that parents stopped speaking German to their children, and English replaced the mother tongue as the language of instruction in the public schools. Today, fewer than 6,000 fluent speakers of Texas-German remain. In 2001, the University of Texas at Austin founded the Texas German Dialect Project to document the dialect and record the last speakers before they disappear forever. Very interesting article. My great great grandfather is of German decent and he lived in the Matamoros, Mexico in the border with Brownsville, Texas. He actually was only fluent in Spanish. I’m thinking it’s likely that his family was part of this voyage because of the proximity. Do you have any info or commentary on the German settlers from this voyage that settled into Mexico?